Sardegi Rural House is a beautiful detached house for full rental, with a maximum capacity of eight people, including children, located at the foot of the Sierra de Lókiz, in the urban center of Ganuza (Navarre town belonging to Tierra Estella, in the middle of road between Pamplona and Logroño). In its two floors it has 4 bedrooms, 2 bathrooms, living room with fireplace, fully equipped kitchen, terrace and garage. It is surrounded by a large garden with green area and fruit trees. It has magnificent views of the mountains and the nearby mountains of Montejurra and Monjardín. - Set in a plot of 800 m2, it consists of a ground floor with living room, rustic style and equipped with fireplace and TV, fully equipped kitchen, a double bedroom and a bathroom. 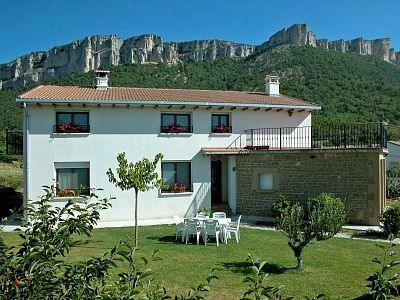 - The first floor houses three double bedrooms, a bathroom and terrace, from which you can see beautiful views of the mountains, the valley of Allín and the Montecassian mountains of Montejurra and Monjardín. In addition, the house has central heating, porch and garden with furniture. - Maximum capacity: 8 people, including children. - Animals are not permitted. Hola. Hemos pasado unos días en esta preciosa casa, desde el jueves 26 de mayo hasta el domingo 29. Nos ha hecho un tiempo maravilloso, porque aunque ha estado lloviendo, lo hacía por la tarde noche y el resto del día solecito. Al margen del tiempo tengo que decir que la casa nos ha encantado. Tiene de todo, el jardín está muy bien cuidado, los niños se lo han pasado pipa correteando por él. Muy limpio, habitaciones muy amplias, en fin todo genial y encima nos ha parecido que estaba muy bien de precio. Por ponerle una pequeña pega diré que la televisión es de las de tdt y funcionaba un poco regulín, pero quien quiere ver la tele con esos paisajes??? je, je, je. El entorno muy bonito, está precioso esta primavera, el nacedero del Uruderra es algo increible. La propietaria muy atenta, así que plenamente recomendable.